"The playing of the Ensemble "GuitArt" ranks among the finest of ensembleplaying with guitars..."
The Ensemble "GuitArt", winner of the 4. 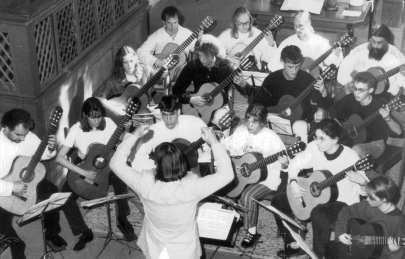 German orchestra-competition 1996, consists of 15 - 20 especially gifted young guitarists of the Music School Heidelberg. Some guests from the surroundings also participate. The ensemble was established 1991 by Helmut Oesterreich. Since then, it has been working an extensive repertoire representing all musical epoches. That includes Renaissance-music of William Byrd and Emmanuel Adriaenssen as well as transcriptions of Edvard Grieg's Peer Gynt Suite. Also contemporary music, graphic scores or Minimal Music and arrangements of pop - and jazz-songs is part of the concert-programs. With the broadcast - corporations SDR and MDR several recordings were done and parts of the repertoire is on a CD - production of the German Music-Council. 1997, the ensemble undertook an exchange with the Cottbuser guitar-ensemble, and in 1998 it toured the Ukraine where it participated at the "International Guitar-Festival of the Krim". In 2000 "GuitArt" performed at the EXPO 2000 in the German Pavillion.